Influenza is reported to be prevalent among the troops, yet is described in the ninth paragraph. The entire supply of US gas marks was imperfect and substitutes had to be secured from the Brits. 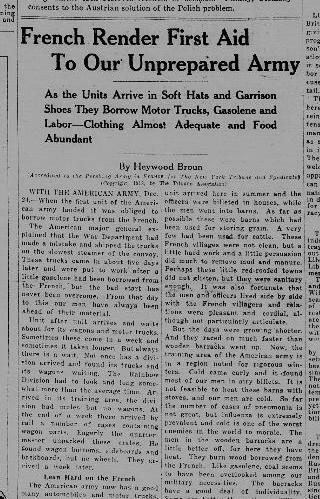 The US Army shortages include clothing, food and coal which would be provided by the French. Source: "French Render First Aid To Our Underprepared Army," New York Tribune, New York, New York. January 10, 1918. Page 1, Column 6.